Lifespan Respite Care Reauthorization Act of 2019 was Introduced in the House and Senate on April 2, 2019. Read more on the Lifespan Respite Reauthorization Action Center! The Mission of the ARCH National Respite Coalition is to secure quality, accessible, planned and crisis respite services for all families and caregivers in need of such services in order to strengthen and stabilize families, and enhance child and adult safety. The Coalition works to achieve these goals by preserving and promoting respite in policy and programs at the national, state, and local levels. When you join the National Respite Network you are automatically a member of the National Respite Coalition, the Policy Division of the ARCH National Respite Network, and can receive the latest updates on Congressional legislative activity important to respite and the families you serve, as well as information from the states about program implementation. The National Respite Network is a program of the Chapel Hill Training-Outreach Project. The Administration for Community Living (ACL) released the Outcome Evaluation of the National Family Caregiver Support Program on December 6, 2018. Survey response data were collected from a nationally representative sample of NFCSP client caregivers, a comparison group of caregivers who do not receive NFCSP services, and a sample of care recipients (CRs) of caregivers in the two groups. This was the first national longitudinal survey of caregivers designed for the purpose of evaluating the NFCSP. The five caregiver outcome measures that were focused on in this evaluation were: mental health, physical health, caregiver burden, caregiver satisfaction, and caregiver confidence. The two-part NFCSP evaluation also includes a previously released process evaluation report. Key among the evaluation’s findings are important insights into the value of respite in reducing caregiver burden and that education and training services can lead to greater caregiver confidence over time. One key finding regarding respite was that, on average, NFCSP caregivers who received 4 or more hours of respite care per week had a decrease in self-reported burden over time, while the comparison caregivers experienced an increase in self-reported burden. In addition, among caregivers who used NFCSP respite care, as the respite hours per week increased, so did the probability of a more favorable response regarding caregivers' perception that services helped them continue caregiving. Additional data were collected on caregivers’ use and perceived helpfulness of NFCSP respite care. 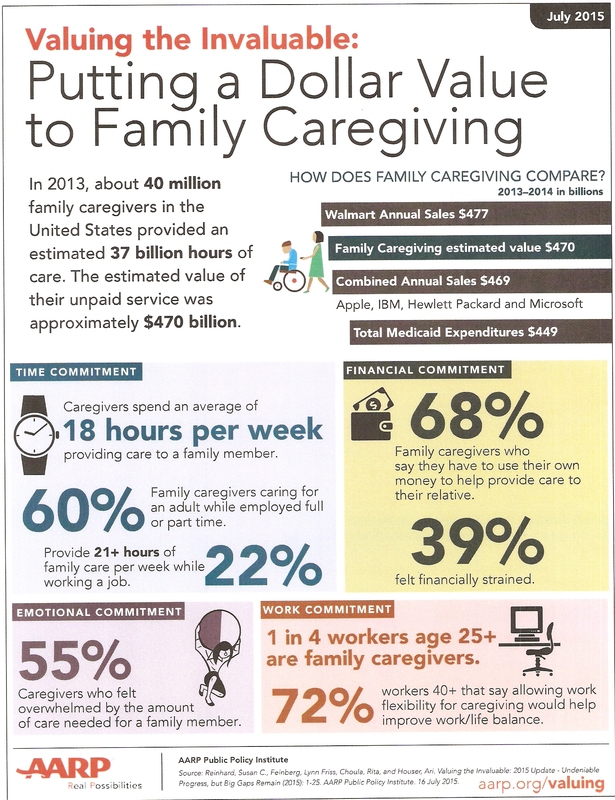 State-by-State Table on the Number of Caregivers and the Economic Value of Caregiving, 2013, click here. The National Alliance for Caregiving and AARP released the 2015 Caregiver Survey results in June 2015. The survey revealed that an estimated 43.5 million adults in the United States have provided unpaid care to an adult or a child in the prior 12 months. They found that while there is a profile of a typical caregiver, caregivers on the whole are becoming as diverse as the American population and include more men and younger "millennial" caregivers. Still, 85% of family caregivers are not receiving respite. New methodologies were used so comparisons with previous surveys are not possible. While caregivers of children were included in prevalence numbers, these caregivers were not included in any further analyses. Many families caring for children with special health care needs at home do so at extreme economic cost. Using data from the 2009-2010 National Survey of Children with Special Health Care Needs, researchers at Boston Children's Hospital found that families caring for 5.6 million children with special health care needs provide nearly $36 billion worth of care annually. The associated foregone earnings were $17.6 billion or $3200 per child per year. A RAND Corporation study estimates the value of informal caregiving in the US by friends and relatives of the aging at $522 billion a year. Replacing that care with unskilled paid care at minimum wage would cost $221 billion, while replacing it with skilled nursing care would cost $642 billion annually. Four in ten adults in the U.S. are caring for an adult or child with significant health issues, up from 30% in 2010. Caring for a loved one is an activity that cuts across most demographic groups, but is especially prevalent among adults ages 30 to 64, a group traditionally still in the workforce. Caregivers are highly engaged in the pursuit of health information, support, care, and advice, both online and offline, and do many health-related activities at higher levels than non-caregivers. 39% of U.S. adults are caregivers and many navigate health care with the help of technology. Researchers at the University of Pennsylvania studied the records of over 28,000 children with autism ages 5 to 21 who were enrolled in Medicaid in 2004. They concluded that for every $1,000 states spent on respite services in the previous 60 days, there was an 8 percent drop in the odds of hospitalization. Dear Senator ___________ or Dear Represenative ____________. 3. Mention you are a Constituent and include your address after you sign your name at the bottom. 4. State your request or purpose for writing in the opening paragraph. 5. Avoid form letters and make it personal. Emphasize the importance of respite to you, community members, and the family caregivers in your state or in the Member's district. 6. Keep the content brief and focused on one issue. 7. Do your research and include a few statistics. Explain the extent of the need for respite in your state (number of family caregivers, the cost born by your state’s caregivers, waiting lists for respite, etc). Use a few statistics that describe the need and benefits of respite, the goals of the Lifespan Respite Care Program, and how the Senator/Rep. can help get funding, and be prepared to share the information. 8. Be courteous and respectful in all communications. 9. Be sure to say Thank you! 10. Write a letter of appreciation if your Senator or Representative responded positively to your request, demontrated support for a bill your are advocating for, or if they supported funding for the Lifespan Respite Care Program or other caregiver supports. 11. Consider Faxing the letter. Faxing may seem old fashioned, but it is a timely way for sharing your letter, is more effective than an email, and provides a paper record. You can find the fax numbers by going to the Member's website (visit www.senate.gov/senators/contact or www.house.gov/representatives). 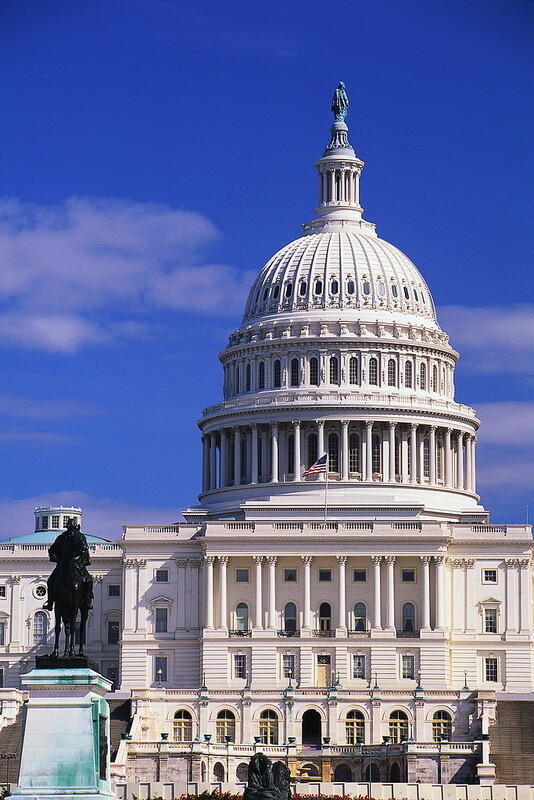 For alerts on Lifespan Respite Reauthorization, visit the Legislative Action Center. For additional appropriations alerts and signed letters, visit Legislative Alerts. Letter from Rep. Jim Langevin (D-RI) and Rep. Gregg Harper (R-MS) and 27 Members of the House requesting $5 million for the Lifespan Respite Care Program for FY 2019. NRC Legislative Alert for FY 19 Lifespan Respite Funding Request, click here. NRC's written testimony to House Labor, HHS, Education Appropriations Subcommittee in support of FY 2019 Lifespan Respite Funding. Similar testimony was submitted to the Senate Labor, HHS, Education Appropriations Subcommittee. NRC was joined by 36 national organizations in submitting a Transition Brief on Lifespan Respite to Trump Transition Team laying out recommendations for the first 100 days of the new Administration. Read the Brief here! Fact Sheet: Benefits and Cost-Savings of Respite. Click here. NRC Testifies before the House Veteran's Affairs Health Subcommittee on Meeting the Needs of Family Caregivers of Veterans. (June 4, 2009). Click here.